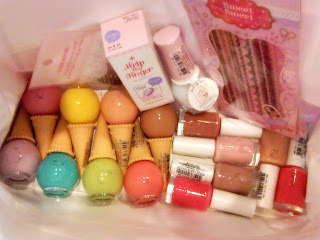 Etude House has released lots of new nail products this season, and I am very excited about the products! As always, the packaging for the products are absolutely adorable. Remember the Ice Cream Nails from the Sweet Recipe collection? There's 8 more new shades of Ice Cream Nails! There's also the Look At My Nails series (on the right of the photo, as seen with the white bottle tops), with 6 shades of pink and beige polishes. I am particularly excited to try out the Ice Cream Nails, as the bright hues are great for nail art. Look out for an upcoming nail art design entry using the Ice Cream Nails coming very soon! 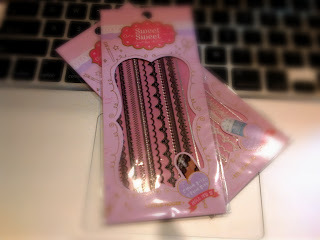 The nail care and nail art goodies are also very interesting and fun. More after the jump! I love the Sweet Lace Nail Seal. There's 8 nail seals per pack. Comes in #1 white one piece and #2 black see-through. I had used this previously for many nail art looks, and the different lace designs offers a lot of options for nail art designs. Black and white are very basic colors as well, so the seals would go with a huge range of nail polish shades. The white is especially lovely with french nail designs, as it adds a dainty twist to the classic manicure. The above three products are just launched and are available at all Etude House Singapore stores. From left to right, they are the Stainless Shaking Balls, Help My Finger Art Gel Coat and Dear My Nails Easy Peel-off Base Coat. I'm extremely excited to try out these products! The Stainless Shaking Balls are great for preventing nail polishes from separating. You can drop one of the balls into the nail polish bottle (two if you want) and shake the polish. The heavy weight of the steel balls help to mix the polish up. The balls are actually pretty heavy and bigger than it looks in the photo. Very useful and will definitely come in handy to help preserve nail polish! The Art Gel Coat and Peel-off Base Coat are two products that I am looking forward to try. I'll be featuring them in my upcoming nail art tutorial, so look out for the next entry! The Peel-off Base Coat is particularly interesting, as I have never seen such a base coat before. All the products shown here are available at Etude House Singapore stores, but colors are subject to availability. The Ice Cream Nails and Look At My Nails retail at S$3.90 each. Help My Finger Art Gel Coat, Dear My Nails Easy Peel-off Base Coat and Sweet Lace Nail Seal retail at S$5.90 each. The Stainless Shaking Balls retails at S$3.80 per pack, with 30 balls in each pack.